Synonyms and Other Names: (moonfish, platy). Identification: Distinguishing characteristics were given by Rosen (1960, 1979) and Page and Burr (1991). It is included in identification keys of Rosen (1960, 1979) and Greenfield and Thomerson (1997). Photographs or illustrations appeared in Rosen (1960), Mills and Vevers (1982), Petrovicky (1988), Dawes (1991), Sakurai et al. (1993), and Wischnath (1993). Formerly known as Platypoecilus maculatus. Size: Females to about 6 cm TL; males to 4 cm TL. Native Range: Atlantic Slope of Middle America from Ciudad Veracruz, Mexico, to Belize (Rosen 1960, 1979; Page and Burr 1991; Greenfield and Thomerson 1997), including Yucatan peninsula (Zambrano et al. 2006). Table 1. States with nonindigenous occurrences, the earliest and latest observations in each state, and the tally and names of HUCs with observations†. Names and dates are hyperlinked to their relevant specimen records. The list of references for all nonindigenous occurrences of Xiphophorus maculatus are found here. Means of Introduction: Probably the result of fish farm or aquarium releases. Specimens in Louisiana were collected near a tropical fish farm. Status: It is locally established, or possibly established locally, in several states, including Florida (Courtenay and Meffe 1989; Nico, personal communication), Colorado (Zuckerman and Behnke 1986), Hawaii (Kanayama 1968; Devick 1991b), and Montana (Page and Burr 1991). It was reported from Texas (Courtenay et al. 1984, 1991). The species was mentioned as being extirpated from California (Swift et al. 1993), but there is no evidence that it was ever established in that state (Courtenay and Meffe 1989). Uncertain in Louisiana. The species was introduced into Blue Point Springs near Lake Mead, in Nevada (Deacon and Williams 1984); the status of that population is assumed to be established locally. A second population, inhabiting Indian Springs, Clark County, Nevada, was considered to be a hybrid with X. hellerii (Deacon and Williams 1984; Courtenay and Meffe 1989); however, in 1989 M. Rauchenberger examined specimens (UF 91919) taken from Indian Spring and determined that they represented X. hellerii and not a hybrid. Impact of Introduction: Southern platys, and other introduced poeciliids, have been implicated in the decline of native damselflies on Oahu, Hawaii. Often the distributions of the damselflies and introduced fishes were found to be mutually exclusive, probably resulting from predation by the fish on the insects (Englund 1999). 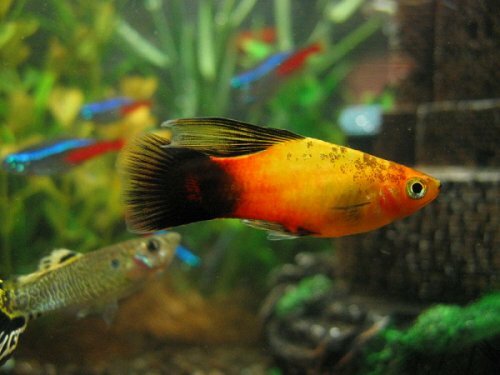 Remarks: This species has long been a popular ornamental fish and exhibits a wide range of color patterns (Rosen 1960, 1979; Dawes 1991; Wischnath 1993). It has long been the subject of genetic investigations and Kallman and Brunetti (1983) examined the genetic basis of several mutant color varieties of this species. Aquaculturists have hybridized it with related species to create a variety of forms and colors, and Florida fish farms raise tremendous numbers of these each year for the aquarium trade. Myers (1940) received unconfirmed reports that X. maculatus, along with several other introduced species, had breeding populations in the Florida Everglades but the location of unspecific; no specimens have ever been taken in the Everglades wetlands (Loftus and Kushlan 1987, Shafland 2008). There is some confusion surrounding the positive identification of a Nevada population (see account for X. hellerii). Courtenay and Meffe (1989) indicated that the Nevada record of Courtenay and Deacon (1982) and Deacon and Williams (1984) was actually a hybrid with X. hellerii. As such, the listing of pure X. maculatus for Nevada is obviously tentative. Nevada records are also covered in the hybrid accounts. Voucher specimens: Florida (UF 91921, 91922, 91923, 91924, 91925, 92140, 97845, 98929, 118152, 171167, 171711, 171712, 171713, 171718, 171719, NCSM 27830); South Carolina (USNM 8760.5001419); Hawaii (USNM 245937.5104403); Nevada (CAS 225529, 226981). Bradley, W. G. and J. E. Deacon. 1967. The biotic communities of southern Nevada. Nevada State Museum Anthropological Papers No. 13, Part-4. 201-273. Courtenay, W. R., Jr., and J. E. Deacon. 1982. Status of introduced fishes in certain spring systems in southern Nevada. Great Basin Naturalist 42(3):361-366. Courtenay, W. R., Jr., and D. A. Hensley. 1979a. Survey of introduced non-native fishes. Phase I Report. Introduced exotic fishes in North America: status 1979. Report Submitted to National Fishery Research Laboratory, U.S. Fish and Wildlife Service, Gainesville, FL. Courtenay, W. R., Jr., and G. K. Meffe. 1989. Small fishes in strange places: a review of introduced poeciliids. Pages 319-331 in G. K. Meffe, and F. F. Snelson, Jr., editors. Ecology and evolution of livebearing fishes (Poeciliidae). Prentice Hall, Englewood Cliffs, NJ. Courtenay, W. R., Jr., D. P. Jennings, and J. D. Williams. 1991. Appendix 2: exotic fishes. Pages 97-107 in Robins, C. R., R. M. Bailey, C. E. Bond, J. R. Brooker, E. A. Lachner, R. N. Lea, and W. B. Scott. Common and scientific names of fishes from the United States and Canada, 5th edition. American Fisheries Society Special Publication 20. American Fisheries Society, Bethesda, MD. Devick, W. S. 1991b. Patterns of introductions of aquatic organisms to Hawaiian freshwater habitats. Pages 189-213 in new directions in research, management and conservation of Hawaiian freshwater stream ecosystems. Proceedings of the 1990 symposium on freshwater stream biology and fisheries management, Division of Aquatic Resources, Hawaii Department of Land and Natural Resources. Dial, R. S., and S. C. Wainright. 1983. New distributional records for non-native fishes in Florida. Florida Scientist 46(1):8-15. Erdsman, D.S. 1984. Exotic fishes in Puerto Rico, p 162-176, In: W.R. Courtenay, Jr. and J.R. Stauffer, Jr., eds. Distribution, Biology, and Management of Exotic Fishes. John Hopkins. Baltimore and London. Loftus, W.F. and J.A. Kushlan. 1987. Freshwater fishes of southern Florida. Bulletin of the Florida State Museum, Biological Sciences 31: 147-344. Mito, T., and T. Uesugi. 2004. Invasive alien species in Japan: the status quo and the new regulation for prevention of their adverse effects. Global Environmental Research 8(2):171-191. Myers, G. S. 1940. An American cyprinodont fish, Jordanella floridae, reported from Borneo, with notes on the possible widespread introduction of foreign aquarium fishes. Copeia 1940:267-268. Piller, K. - Southeastern Louisiana University. Rosen, D. E. 1960. Middle-American Poeciliid fishes of the genus Xiphophorus. Bulletin of the Florida State Museum Biological Sciences 5(4):57-242. Shafland, P.L., K.B. Gestring and M.S. Standford. 2008. Florida's exotic freshwater fishes - 2007. Florida Scientist 71: 220-245. St. Amant, J. A., and F. G. Hoover. 1969. Addition of Misgurnus anguillicaudatus (Cantor) to the California fauna. California Fish and Game 57(2):330-331. Williams, J. D., D. P. Jennings, and D. C. Haney. 1992. Exotics in the Indian River Lagoon System. National Biological Survey, Gainesville, FL. Unpublished manuscript. Zambrano, L., E. Vazquez-Dominguez, D. Garcia-Bedova, W.F. Loftus, and J.C. Trexler. 2006. Fish Community Structure in Freshwater Karstic Wetlands of the Yucatan Peninsula, Mexico. Ichthyological Explorations of Freshwater 17: 193-206. Zuckerman, L. D., and R. J. Behnke. 1986. Introduced fishes in the San Luis Valley, Colorado. Pages 435-452 in R. H. Stroud, editor. Fish culture in fisheries management. Proceedings of a symposium on the role of fish culture in fisheries management at Lake Ozark, MO, March 31-April 3, 1985. American Fisheries Society, Bethesda, MD.